As of January 31, my LinkedIn homepage will be a little less crowded. No longer will I be able to see tweets from my followers, tweet, reply and retweet from a handy box in the right sidebar. Alas! LinkedIn is killing its standalone Tweets application? LinkedIn’s cryptic message emailed on January 19 about dropping Tweets says they reviewed how members were using Tweets and found they could “better invest” resources in building other products for members. According to a post by TechCrunch about LinkedIn’s decision, it was primarily a case of redundancy. Members weren’t using the application because they could join their LinkedIn and Twitter accounts and tweet using the #in hashtag. This interpretation concurred with the Tweets Application Shutdown message in the LinkedIn Help Center, which said, ” Tweeting with #in will still display the Tweets on your profile. A more business-focused use of Twitter? Was it just a little-used, unnecessary widget sucking resources from newer, more useful applications, such as Signal and LinkedIn Today? Or was it also the way some people used it that prompted its demise? My guess was that a number of members got tired of seeing Twitter updates with more than business-related content. (See my post LinkedIn is not Twitter). 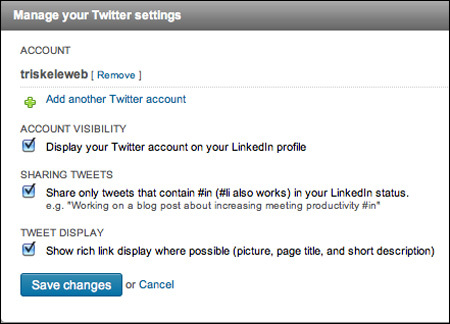 By Linkedin limiting its display to messages with the #in hashtag, members would see less non-business focused content. So by leaving the Sharing Tweets box unticked, members can still post all their Twitter updates, regardless of whether they pertain to business or to what they had for breakfast. Basically then, the Tweets application has become just another widget to move off the sidebar. Changes to the homepage layout and to the Contacts section have also contributed to its death. At one time, the Tweets app displayed on the Connections page those in your network you were following and those who you weren’t. Now members can click the Twitter “Follow” button on a person’s profile. 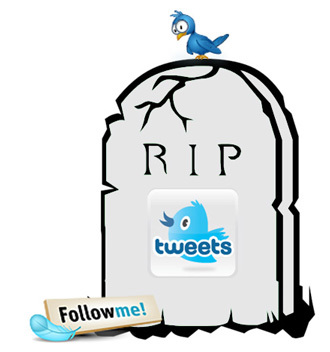 So R.I.P. Tweets. Perhaps, though, the change will prompt more members to check their Sharing Tweets setting and tick the box to share only tweets with the #in or #li hashtag. What do you think of LinkedIn’s integration with Twitter? Share a comment about your experience with LinkedIn and Twitter in the comment box below. Will you miss LinkedIn’s Tweets Application? This entry was posted in LinkedIn, Social Media Tips and tagged LinkedIn, redundancy, status updates, Tweets, Twitter. Bookmark the permalink.